Happy Monday to you! We had a fun weekend and I hope you did too 🙂 As long as baby stays in, I’ve got about another week of baby things (and I promise after that there are grown up things in progress lol). 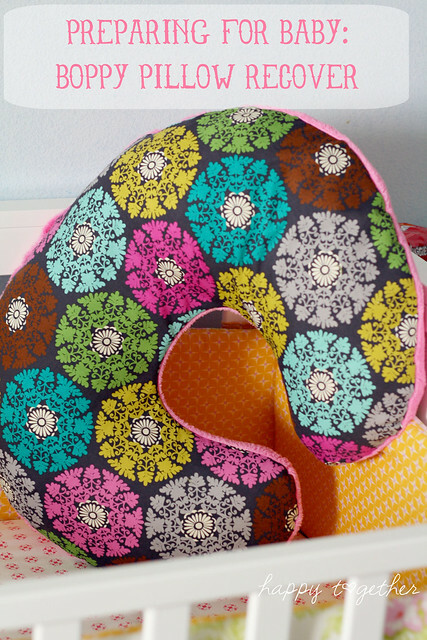 Another quick baby project was recovering the boppy pillow. I just used the cover I had and made a pattern, but I did a quick search and found a pattern with instructions for you 🙂 You can find it here. It’s on top of the hospital bag ready to go with us now. I’m so ready for her to come! I’m thinking about making my own cover. None of the ones in the store really entice me that much. So adorable!!! Here’s the one I made from the book “Simple Handmade for baby” by Lotta Jandsdotter. I highly recommend this book, filled with lots of great and simple patterns. 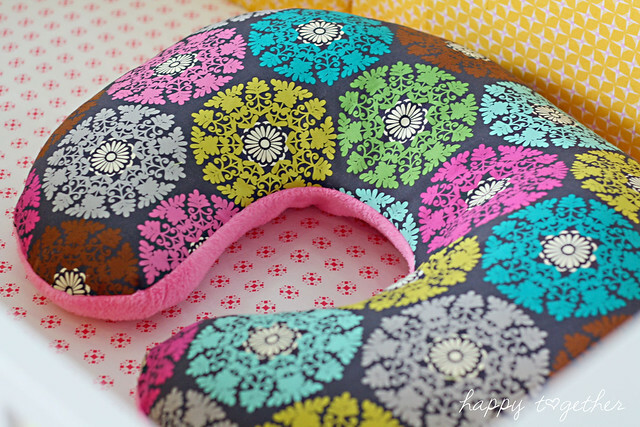 Love love love that boppy cover! I so wish I knew how to sew so I could make cute things for my kiddo! Love all the baby tutorials! I love it! The colors you chose are so pretty!! I so wish I had found your blog last year when I was pregnant with my daughter! I love it and broke out the sewing machine as soon as I came across the headband pattern. I might have to plan on baby #3 to make some of the cute things you have! You really do look like you are ready for this little one to arrive. Great colours in the fabric. 🙂 Is the boppy pillow to help stop baby’s head from flat spotting? this looks so soft and snuggly jess. I loved my boppy so much. Hugs to you and your fam, wishing you a safe and easy delivery! Thanks so much for linking to my tutorial! I love how yours turned out!! Love the fabric! I made an apron out of it earlier this year. 🙂 So I definitely will need a new boppy cover for our next child. Our old one is so worn and gross. Thank you for the link! lindo¡¡¡ gracias por compartir tus trabajos. love the fabric! do you by chance know desiner’s name ? i’ll try to do one cause my back need it . i’m bregnant in my first month.